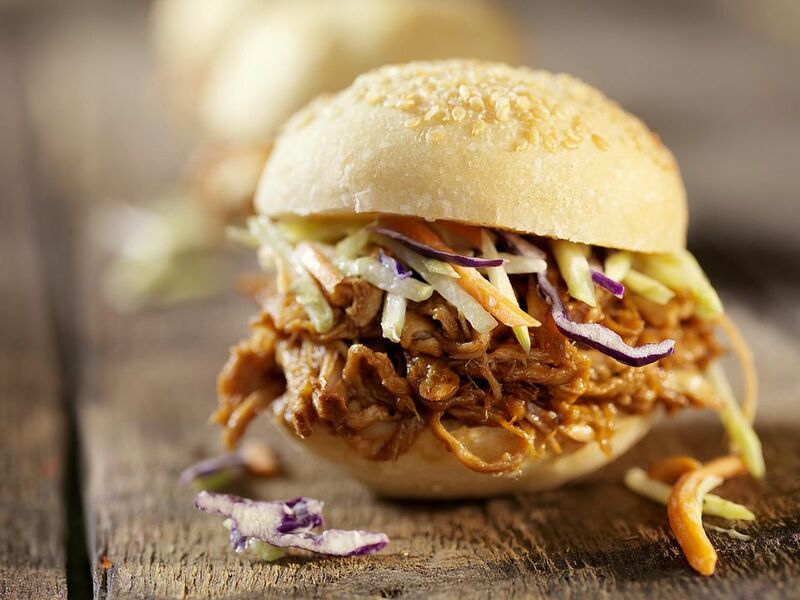 This is your shortcut solution to Carolina pulled pork barbecue. While it lacks the authentic flavor of slow smoked barbecue, it is quite delicious. Trim pork roast of excess fat. Heat oil in large pot or skillet. When the pan is nice and hot, place pork into skillet and sear all sides. This will take about 5 to 6 minutes. Set slow cooker for high heat. Remove pork from skillet and place into slow cooker. Pour vinegar and water (or broth) over roast and turn to make sure the vinegar reaches all sides. Cook on high for 1 hour, reduce temperature and cook on low for 8 to 9 hours, or until roast is tender enough to pull apart with your fingers. Once cooked, remove roast and discard liquid. Shred pork roast into small pieces and return it to the slow cooker. There should be enough barbecue sauce to coat the meat but not so much as to make it runny. Serve on sandwich buns with freshly made coleslaw.